The Scottish Highlands is the rugged northern and north-western portion of Scotland. Dunrobin Castle - Gorgeous castle with fantastic exterior, gardens and falconry demonstrations from 11am and 2pm every day. About an hour and a half north of Inverness. Adults £8.00, children £5.00 OAP's and students £7.00 for castle and gardens. It should be noted that there are no falconry demonstrations on Sundays. 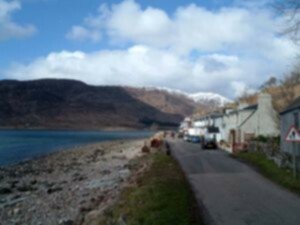 Applecross - See the views from Scotland's highest mountain road on the way to Applecross at about 2000ft! Isolated peninsula known for its rugged beauty. Seal trips with Calum's at Plockton guarantees seals on your excursion or your money back. Not far from Kyle of Lochalsh area. Inverewe Gardens - Lovely National Trust For Scotland garden, an hour north of Kyle of Lochalsh. 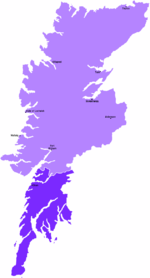 In nearly all areas of the Scottish Highlands, Scottish Gaelic or 'Gàidhlig' is spoken by some locals, however everyone speaks English fluently and will be happy to converse in it. The main airport serving the Scottish Highland region is Inverness Airport, with scheduled flights to destinations around Scotland and England as well as international scheduled flights to Amsterdam, Dublin and Dusseldorf. There are smaller airports within the Scottish Highland region at Campbeltown and Oban that offer scheduled service to connecting flights in Glasgow; as well as Wick Airport which offers connecting flights to Edinburgh Airport and Stornoway Airport that can be reached from scheduled services to/from Aberdeen Airport. First Scotrail offers services from Glasgow and Edinburgh (via Perth) and Edinburgh (via Aberdeen) north towards Inverness several times a day. The West Highland Railway runs from Glasgow's Queen Street Station to Oban, Fort William and Mallaig. There is also the Caledonian Sleeper from London's Euston Station to/from Fort William and Inverness via Edinburgh. This overnight service must be booked in advance. Passengers heading for Fort William in the seated carriage must change carriages at Edinburgh Waverley. Scottish Citylink offers a relatively frequent service to many parts of the Highlands from Glasgow, Perth and Inverness. West Coast Motors offers bus services throughout the Argyll and Bute region as well as buses from Glasgow to Campbeltown and Oban. Stagecoach offers services across the Higlands. Some communities are served by the Royal Mail's Postbus service. There are numerous highways from the Central Scotland region into the Scottish Highlands. One of the most scenic involves the drive along Loch Lomond, out to Oban then north to Fort William and along Loch Ness to Inverness. Scottish Citylink, West Coast Motors and Stagecoach should help to get you moving around the region if you are not in a car. Air service means connections in Glasgow while there are only a few train lines through the region, notably the West Highland Railway. Many of the roads, especially in the more remote areas of the North West are single track with passing places. Driving there is a pleasure. 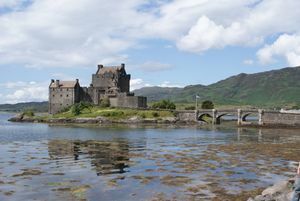 Eilean Donan Castle is one of the most recognized castles in the world. It has appeared in many films including "Highlander" and James Bond film "The World Is Not Enough"
Hike in the Torridon mountains. After the Highlands, the next logical place to explore are the islands: the Hebrides, the Orkney Islands, and the Shetland Islands lie to the northwest and northeast. This page was last edited on 21 April 2018, at 16:46.